Creation of a gametized bitcoin faucet, where users will play an addictive runner/flappy bird-like game. Gamified faucets increase user retention and profitability, as well as open up the game to non-faucet users, to increase its profitability. Creation of a gamified bitcoin faucet, where users will play an addictive runner/flappy bird-like/game. Gamified faucets increase user retention and profitability, as well as open up the game to non-faucet users, to increase its profitability even further. This will be one of the most fun faucet experiences and be able to reach a very wide and viral market. Due to the high amount of user incentives and better quality ads compared to web faucets, as well as a fun and addicting faucet experience through playing a game (resulting in a high retention rate), we are expecting a very high chance of profitability per user daily easily reaching up and over $0.01. Meaning that for 1000 daily faucet users we are looking at a profitability of $10/day, or $300/month. With 10,000 daily faucet users we are looking at a profitability of $100/day or $3,000 per month. Considering that we have around 5,000 PaidVerts app users who use PV app daily just for making it easier for them to view ads, we would likely convert most of those and more, for the option to earn something extra each day. That alone sets us up with a nice day-1 start, and due to the nature of the app game, we should easily expand it to all other existing faucet users. Having a friendly, fun, addictive and profitable faucet, should make it easy to attract faucet users from poor designed, over-ad-spammed faucets out there. Note that the above are our first estimations, and they could be slightly lower, or significantly higher after we optimize the monetization, user experience and spread the game into as many non-faucet users, who will be feeding the profits of the app additionally. 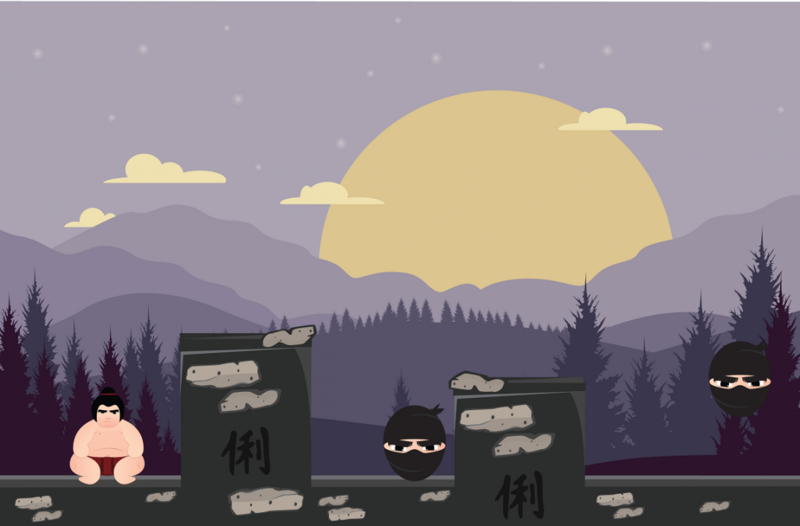 Sumo roll will be an app faucet game (made for both IoS and Android in Unity), where users will be controlling their character with simple taps, to avoid obstacles, and get as far as possible. It will follow the principles of the addictive skill runner/tap games which are one of the most popular and profitable app games these days. Players will gain in-game coins, based on the progress they make and the further they get the more coins they will be getting. Users will be able to convert and cashout these coins into satoshi (bitcoin), basically allowing them to earn while playing a fun addictive game, at which they can get better and better at. This not only removes the boring factor while usually haunts faucets, but it also makes the game fun and addictive for users. Even if they are not playing it for the possibility of earning real cash from it, the game can be fun for anyone, expanding its reach and profitability. As far as monetization goes, since it is a mobile game, there are far more (and far more profitable) monetization options compared to a typical website faucet, which typically struggle to make any considerable profits. 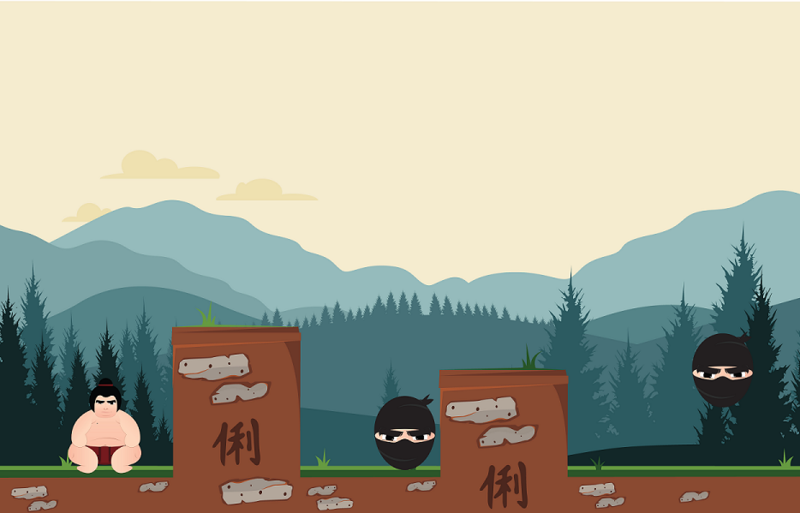 Users will play the game as an endless level of obstacles, and the further they get, the better they will be rewarded. The mechanics of the game are addictive, yet very simple users simply have to tap (click) to make their character jump (or double jump) over obstacles, which get increasingly difficult. 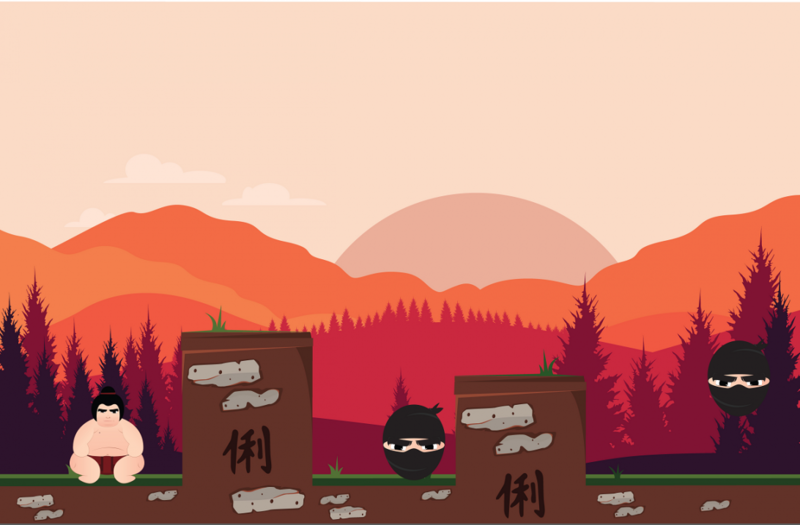 There will be various obstacle types: different sized static blocks and randomly appearing moving obstacles - sumo enemies which have different characteristics such as movement pattern, speed, size. This will make the game both challenging and not repetitive, but at the same time allow player to hone their timing skills in order to be able to get as far as possible. Users will get different amount of coins for each tile traversed, based on how far they are (i.e. 1-100 tiles they get 1 coin/tile, 101-200 tiles they get 2 coins/tile...). User get 3 chances to play the game each day, and after using those chances up they either have to wait 30 minutes before getting their next chance or watch a rewarded video ad to get another chance immediately. After dieing/hitting an obstacle they will be able to either claim their winnings, or continue their attempt at where they stopped, by watching a rewarded video ad. This will give them a huge incentive to watch ads as it will increase their chances of earning more via the faucet. There will also be some interstitial, preroll and banner ads shown to the user at various points in the game to maximize any revenue we get from players. This will help increase both the faucet profitability for users, as well as investors of the project. Monetization via offerwalls will also be included, giving users a chance to win additional in-game coins. Users will be able to spend their coins on various claim packages - the more expensive the package the higher chances it will have of giving a user one of the bigger faucet claim rewards. This will incentivize users to play more and keep coming back, in order for them to maximize their earnings with the faucet. To make the claim procedure fun and interesting, it will be a simple animation, where the character will roll a certain distance and based on the distance, the user will get one of 5-tier claim rewards. To ensure that the faucet will be both very attractive to users as well as remain profitable, we will be implementing a reward system that will distribute the reward funds in such a way that there is always rewards available to claim for users. The funds allocated to these pools will be based on advertising earnings the faucet has made. We will be experimenting between various ratios to ensure we can get the most profit out of the faucet while keeping the most users engaged and happy with the earnings. Admins will set an amount of faucet cash pool rewards for each day, which will be divided into 24 hour segments. The claim rewards will be relative to the current prize fund pool - ensuring there's always a prize that can be claimed. By also setting a minimum claim reward (even in case where the pool has been drained to a point where the relative amount is smaller), we will also ensure the faucet remains attractive for users at all times. And the minimums are set at rates which will with the extra traffic cover the minimum amounts easily, which were not covered by the preset pool fund fully. This way of money management will ensure there will always be a fair amount of money to claim, no matter the time zone, or how often you come back in a day as well as make sure we are not sending - extra traffic away or prohibiting them to claim at least some minimum amount, which we can be sure to get back with their traffic value easily. This project can be funded in portions of $10. Not achieving significant user retention and not high enough advertisement revenues causing the profitability of the faucet per user being far smaller than our first earning estimations, resulting in a long (1 year+) repayment time of 120%. In the event that a project does not repay your full return by the end of 1 year, your unpaid return will be paid to you in MTV Royalty Positions at current market price (price at the time of the end of 1 year term) The 1 year term begins after project launch. Get a share of 80% of unlimited project profits based on the portion of the project shares you own for 1 year after project launch. If the project profits do not return you at least 120% within this 1 year, the unpaid part of your guaranteed 120% profits will be paid to you in the form of MyTrafficValue's Royalty Positions at current market price (price at the time of 1 year term has passed). The 1 year term begins after project launch.